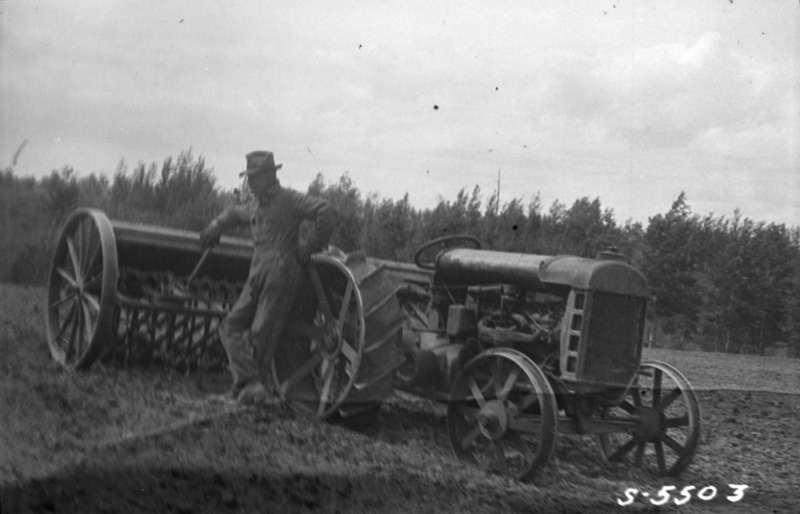 Two views of an early (ladder-sided radiator, 6 spoke rear wheels) Fordson in the field. Both photographs are simply captioned "1922". He must be counting the seeds to see if he has the grain drill set up properly. We used to drag a log chain behind the grain drill to pull a little bit of dirt over the seed. Wonder what kind of grain drill he's using. 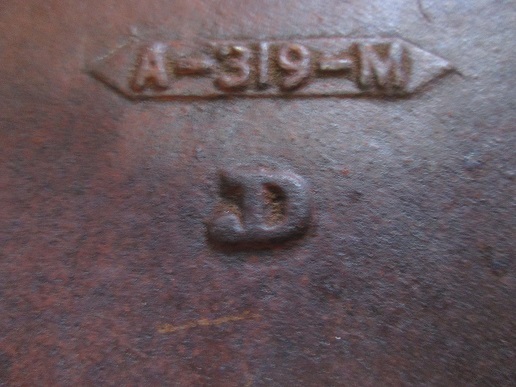 A lot of those early wood box drills had a cast end plate with the makers name and location. Some of them were pretty fancy. It looks like this one has some writing but I can't make it out. When looking closely at the pics the farmer doesn't look like he's moved. The picture was taken at two different angles without the farmer moving. And after looking at the drill closer it has two step plates on the back. The writing isn't clear enough on the box ends to make out what brand it was. 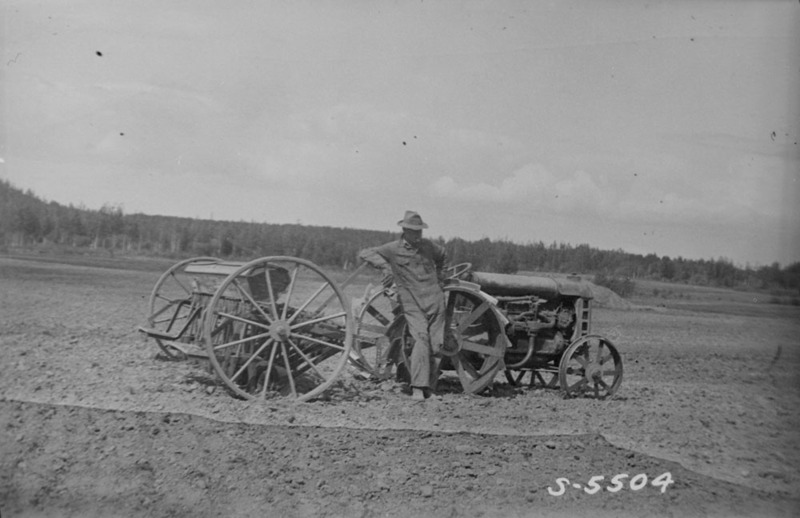 I'll bet it was a mule drawn drill that was converted to be pulled by the Fordson tractor. The rear seat was probably removed. Other than that what were the two step plates for. ?? I suspect in those days they filled the grain box with buckets so they would need the step plates to stand on. I bet this fellow doesn't stand still very often,so he may out of seed and waiting for a new supply from the grainery. I had an old fellow tell me once that he could always tell when a certain neighbor was farming with the Fordson,he could hear the gears grinding from wherever he was. I think most small grain was handled in gunny sacks? Two grain drills of the time might be Oliver Superior and John Deer Van Brunt.The large rear box was for grain and the front was for grass seed.Some of the drills also had 3 boxes on them,and i think steel wheels were a plus as you never had a flat on something seldom used more than once a year! The mice would raise several tribes and needed to be cleaned out before use.Bud in Wheeler,Mi. 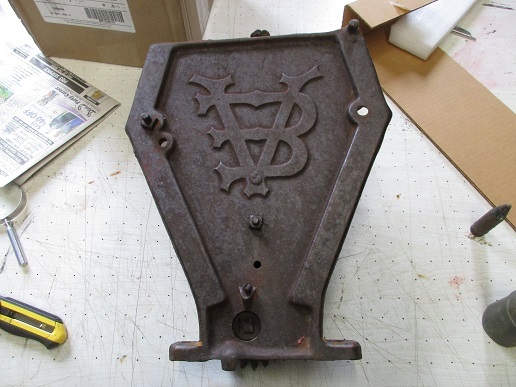 Just for grins I'm adding pics of a Van Brunt drill grain box end. On the inside is the John Deere logo. These are heavy cast iron and getting very collectable in their own right.